ESET Cybersecurity for Mac is easy to install and setup features intuitive dashboard displays and provides instructions on how to address security threats. By integrating seamlessly with your Mac, ESET Cybersecurity for Mac works quietly in the background with low memory usage and minimal alerts. Advanced setup for power-users to control scan depth, set file, folder or volume exclusions, set a level of heuristics and much more. Installing security software is the first step toward cybersecurity. The second is educating yourself about safe Internet practices. That’s why ESET Cybersecurity Training is complimentary with ESET Cybersecurity for Mac. 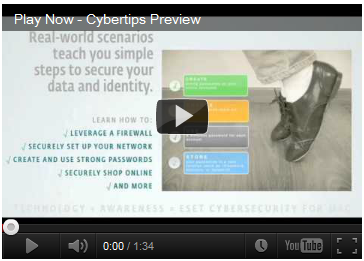 ESET Cybersecurity Training uses real-world cybercrime scenarios and gives you essential safety tips to make your online experience even safer. ESET is the first and only company in the world with ICSA certification for Mac OS X.
ESET Cybersecurity for Mac features the same engine as ESET NOD32 Antivirus Business Edition for Mac OS X, which earned the certification. ESET Cybersecurity for Mac is user-friendly and easy to install. If you ever have questions or problems, you’ll get the answers for free.